The Yusupov Palace located on Moika Embankment is one of the most beautiful examples of classicism style constructions in Saint Petersburg. Decorated with six-column portico, the palace delights with harmony of proportions and silhouette elegancy. On the site where the palace is situated used to be the mansion that belonged to Prince Shuvalov. In 1760s the mansion was overbuilt and extended to the design of the architect J.-B. Vallen de la Mothe. In 1830 the palace became the property of Prince N. Yusupov, who was one of the richest and the most powerful persons in Russia. He ordered to throw out a new wing and rebuild the gala rooms' suite of the palace. In 1858-1859 such architects as I. Monigetti, A. Stepanov, A. Vaitens and others participated in the palace interiors planning. The Yusupov Palace features original interiors of the 19th-beginning of the 20th centuries. The rooms are decorated in various styles: baroque (the theater), Empire style (gala halls), Oriental style (the Turkish study), neoclassicism (some rooms of the ground floor) and others. The interiors amaze with rich decorations that includes paintings, carving, marble, mirrors, crystal chandeliers, silk, exquisite furniture and so forth. The Yusupov family possessed extensive collections of paintings, sculptures and applied art objects. Some of them are on the display in the palace exposition. The palace is worth visiting not only as one of the best monuments of the palace architecture of the 19th — beginning of the 20th century but also from the historical point of view. The palace, to be precise — its cellar, became the setting of the murder of one of the most scandalous figures in Russian history — Grigory Rasputin. Nowadays the cellar where the dramatic events took place houses the exhibition «Grigory Rasputin: Pages of Life and Death». The visitors can see the wax figures of Rasputin and plotters and other interesting exhibits. 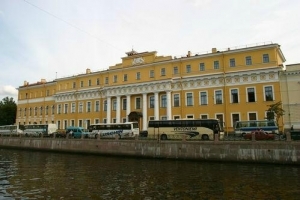 In 1918, after the October Revolution, the Yusupov Palace was expropriated, and the art objects from the palace were sold or transmitted to the State Hermitage. Since 1925 the Teachers' House was housed in the palace. In 1958 the interiors of the palace were badly damaged by fire. 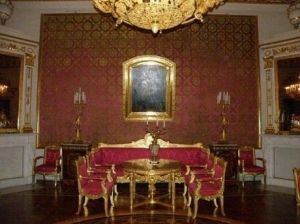 It took several years to restore the rooms and the halls of the Yusupov palace. In 1987 the theater of the palace was opened to the public: it became the place for music concerts and literature evening arrangements. Nowadays the visitors can admire the splendor interiors of one of the most beautiful palaces in Saint Petersburg. Central-Inn mini-hotel is located in the very heart of St. Petersburg, close to such famous attractions as St.